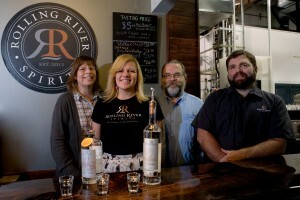 Rolling River Spirits is a Portland, Oregon based family-owned and operated business producing handcrafted organic spirits from still to bottle. We use the freshest organic ingredients such as wheat in our vodka and will do the same when crafting our future production of whiskey. We are currently working on our organic certification. Our family has a keen interest in craft and dimensional arts. Our Master Distiller, Tim has produced and shown his artwork in many local art galleries and on the coast and has taken on numerous privately commissioned projects for folks in the northwest. Manning the Machine: Rolling River Spirits uses two styles of stills: the Alambic style which is primarily used for single and double run processes; and the Continuous Run Reflux Column still that is used to produce a finely controlled volume of product. Tim began building the Rolling River stills in 2010. The reflux still is designed to recycle energy and to conserve water. Tim Rickard started with home brewing many years ago and has created a vast array of beers, from traditional lager’s, porter’s, and IPA’s, to fruit and spice flavored exotic blends. As time progressed, his interests expanded into the world of spirits distillation. Tim started to explore the industry, trained in the art and science of distilling, and began tasting spirits and requesting information from distilleries in Oregon, Washington and all the way to New York. Finally, in 2011, the development of Rolling River Spirits was underway, and as the business grows, Tim looks forward to trying new recipes and creating new products. Outside the Distillery: As a true artisan, Tim’s other interests range from camping in the wild, to working with a vast assortment of art forms; from welding, metal work and glass blowing, to concrete sculpture and woodworking. Spirits Selections: Rick enjoys all spirits, and especially kicking back and enjoying a fine drink – from a clean vodka or a sweet and oaky scotch, to a Reposado tequila or a neat, smooth and creamy rum. Industry Interests: The art of craft spirits. Rick has always had a ceaseless interest in spirits and art, so combining the two is natural for him. In so many ways, distilling spirits is a true art form. Outside the Distillery: Rick enjoys woodworking, metalworking, cooking and photography. The Project: “I want to put my own, Tim’s and Joan’s artistic talents to the ultimate test.” Rick appreciates the hard work and time it takes to create something that can bring out so much enjoyment – building and producing the distillery from scratch. Industry Interests: Joan enjoys learning more about the craft spirits industry and networking with other craft distillers from Portland and beyond. She’ll never pass up an opportunity to visit small craft distilleries and try new spirits — especially if that spirit is Gin. When not at the distillery: Joan can be found enjoying one of her many hobbies such as cycling, gardening or quilting. 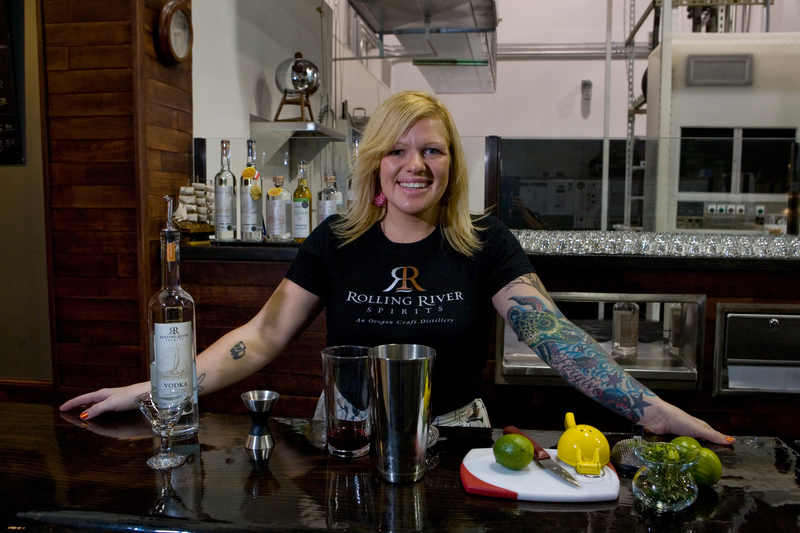 At Rolling River Spirits: Joan enjoys meeting new people and sharing the family’s story and craft products with tasting room visitors. Industry Interests: Elisabeth is lover of all that is cocktail and food related. With a background in craft cocktails, wine & beer; Elisabeth is always thinking of new cocktails and dishes to pair with them. She’ll never miss a chance to bartend and/or cook for family and friends. Visiting bars and restaurants all over Oregon Washington is not only a huge passion of hers’, its part of her job! When not at the distillery: Elisabeth can be found shredding up the slopes of Mt. Hood and snuggling with her puppies, Nugget and Rockie. Drink of choice: If Bols Genever is on a bar-shelf, she’ll order a double, neat! If not, a classic Moscow Mule is her go-to! 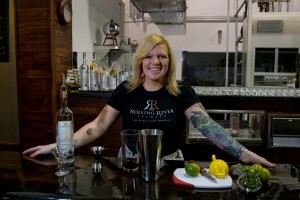 At Rolling River Spirits: Elisabeth heads up the Marketing and Sales departments. She’s constantly on the go, meeting and talking to local restaurants, liquor stores and distributors.